Amber Steele’s boyfriend Jenner Branton asks her on a weekend getaway to a resort on Redplum Island. Because he has bought a discount deal for four, he also asks along her sister Sophie and Bridgette, another waitress from the restaurant where all three girls work. They arrive on the island to find the resort considerably less than expected. A dead shark is then found washed up on the beach. When Jenner goes to pose for a photo next to it, it comes back to life and devours him. The sheriff and others are killed in short course. With a storm closing in, they are unable to get help from the mainland but luck onto a military channel where their call is answered by Maxwell Cage, a sergeant stationed at the scientific research base on the island. From Maxwell, they learn that Diane Palmer has been conducting experiments in regeneration of dead tissue using sharks at the station. However, her test subject Bruce has made an escape. It has become a zombie shark, turning other sharks into the zombies. As the group tries to find what refuge they can against the menace, they realise that the zombie shark bites are also turning people into zombies. The gonzo shark film has become its own mini-genre during the 2010s. Up until the late 2000s, the shark film existed as a steady output of Jaws (1975) rip-offs, which moved steadily down the B end of the market from the 1990s onwards. 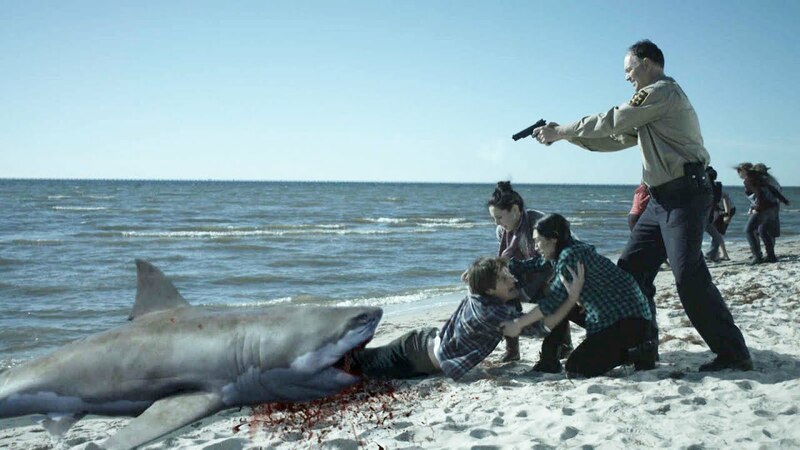 With the likes of Shark in Venice (2008) and especially Mega Shark vs Giant Octopus (2009), the shark film began a move towards the increasingly tongue-in-cheek, reaching its zenith with the bad movie hit of Sharknado (2013). There have been a great many shark films in a similar vein – see the likes of Dinoshark (2010), Sharktopus (2010), Sand Sharks (2011), Snow Shark: Ancient Snow Beast (2011), Swamp Shark (2011), 2-Headed Shark Attack (2012), Jersey Shore Shark Attack (2012), Jurassic Shark (2012), Avalanche Sharks (2013), 90210 Shark Attack (2014), Raiders of the Lost Shark (2015), Roboshark (2015), Shark Exorcist (2015), Ice Sharks (2016), Planet of the Sharks (2016), Sharkansas Women’s Prison Massacre (2016) and Trailer Park Shark (2017), among others. You can see the thinking that has gone on here – why not combine the two most popular B movie fads of the 2010s, the gonzo killer shark film and the zombie film? Alas, while you can see that this was an idea and a title that the writer/producers could instantly sell, nobody put much thought into how it might work. A zombie shark prowling about doesn’t look too different to a regular shark. There is one scene early on where a dead shark washes up on a beach and startles everybody by returning to life and a couple of other minor scenes with a still-alive severed shark’s head. However, the film seems to have run out of any ideas about what to do with zombie sharks after that point. To justify the concept, the script also sees the need to throw in some contrivation about the zombie shark turning the people it bites into zombies too, although these never feature much throughout either. You could have fairly much excised the word zombie from the film and just had a regular killer shark film. Zombie Shark was the directorial debut of Misty Talley who had previously worked as an editor for the low-budget production company Active Entertainment. She subsequently went on to make Ozark Sharks (2016), Mississippi River Sharks (2017) and Santa Jaws (2018), also for Active Entertainment.